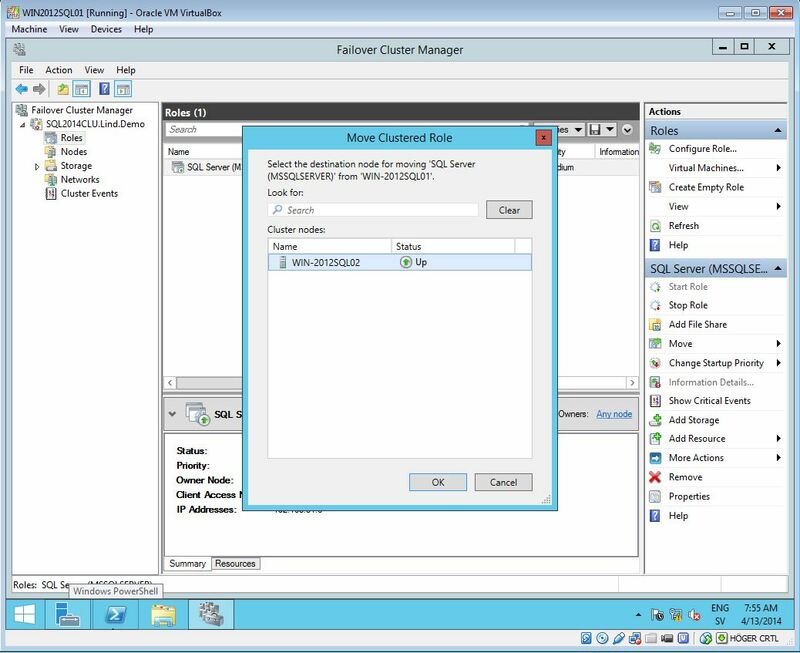 In this blog post, I’ll demonstrate how to find the currently active node in a SQL Server cluster, and how to do a manual failover to another node. 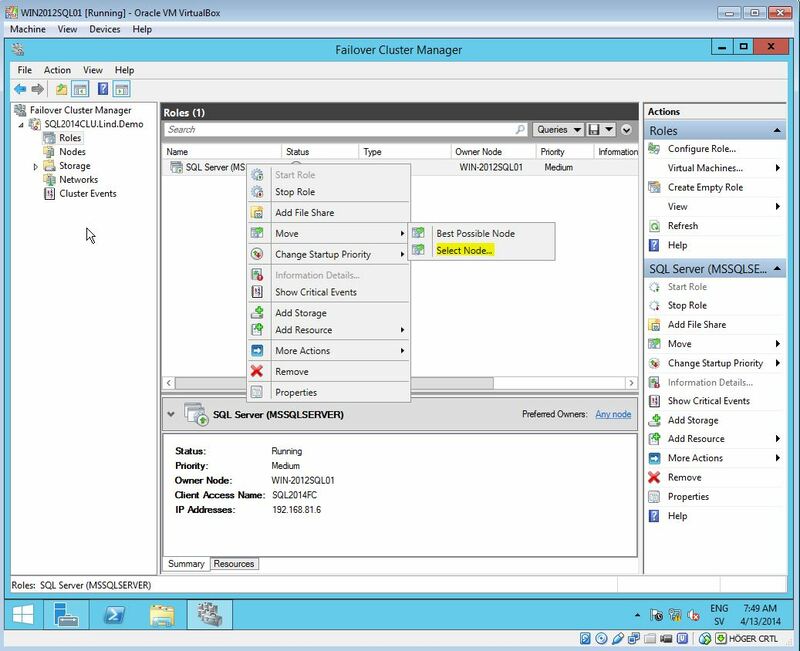 Note that a failover will result in a short down time for your SQL Server environment. This is because a recovery (rollback and roll forward of transactions) will be performed on the new active node in the SQL Server cluster. In an environment with long running transactions, the time for the recovery may be substantial (how to check the latest recovery time). So don’t do failover in a production environment unless absolutely necessary. Preferably, use a cluster lab environment to test things out first. 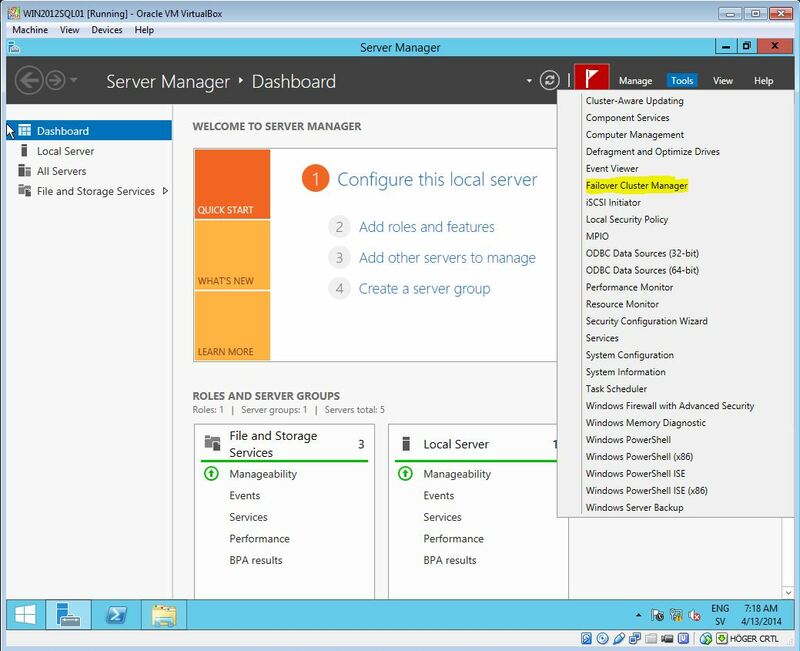 In this demonstration, I am using Windows Server 2012 R2 and SQL Server 2014. 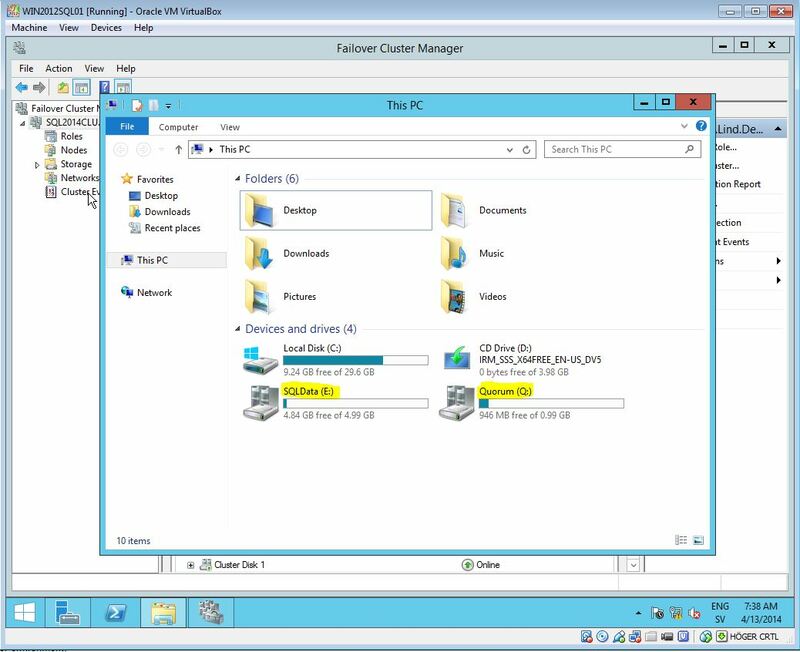 I have two nodes in my cluster (WIN-2012SQL01 and WIN-2012SQL02), both running the default SQL Server instance. The cluster is named SQL2014CLU. To set up the virtual environment to experiment with my own SQL Server cluster, I followed Jonathan Kehayias superb blog series “Building a Completely Free Playground for SQL Server”. 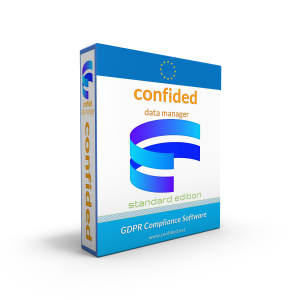 The first post in the series can be found here. The blog series uses Windows 2008 R2 and SQL Server 2008 R2, but with minor modifications the guide can be used to create a lab environment with Windows 2012 R2 and SQL Server 2014. 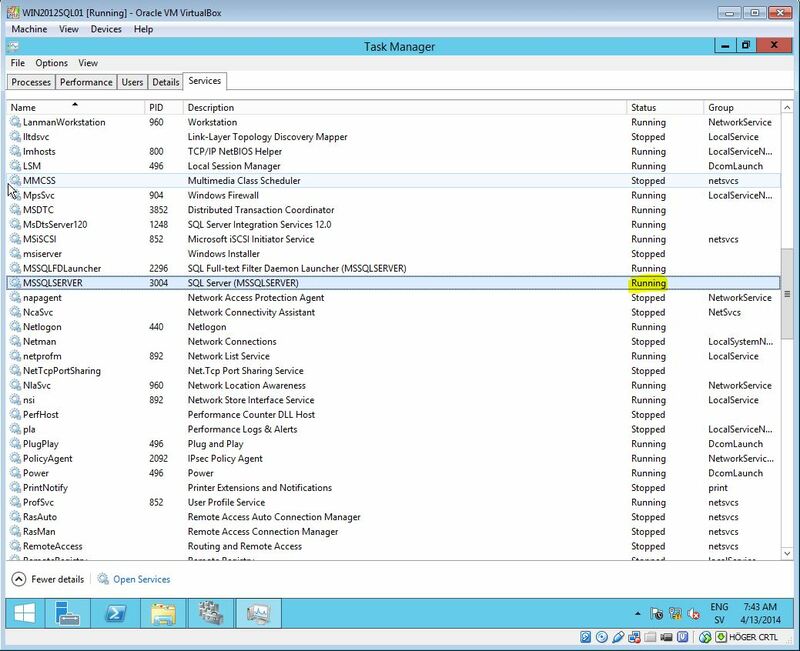 After a while (SQL Server will start up and perform a recovery on the new active node) the roles will be switched. Do you know the command line or PowerShell commands to do this same thing? I’d like to be able to automate it as a script. No, I have never used a script for this. 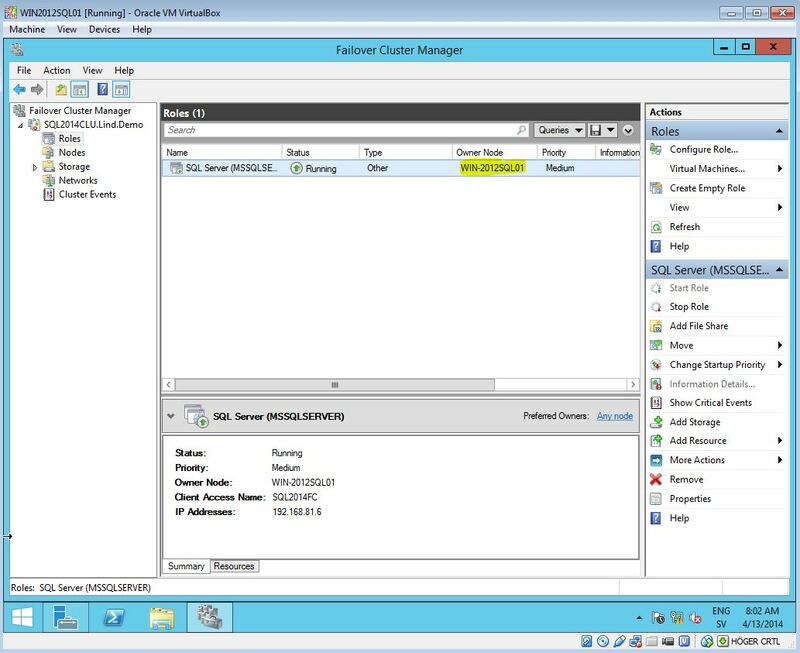 I have three SQL 2014 clusters on one window 2012 cluster(active/passive), can I failover from the windows cluster level so that all three SQL clusters will also fail over as result of this? There is any way to prevent down time? I have a cluster where a I to move roles but the last one cut connections from application servers.